The annular ball caster bearing is a form of precision bearing designed with two machined, hardened raceways that fully enclose ball bearings, which are then mounted within the wheel, meaning it is not field installable. Ideal for light to medium duty applications, these bearings roll with ease and make minimal noise. Like all other precision bearings, the annular ball bearing requires no maintenance and can endure temperatures up to 250°F. Also noteworthy is that this bearing's side thrust load rating has 20% radial capacity. Bronze caster bearings are composed of a bronze metal alloy material combined with other additives that completely eliminate any possible porosity. 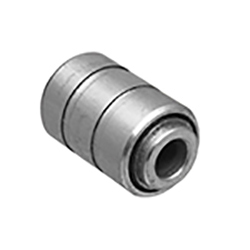 This bearing is able to endure the vastest range of operable conditions of all options, topping out at a temperature of 525°F. Ideal for environments where exposure to water is inevitable or corrosion is possible, bronze caster bearings are tolerable of some of the harshest conditions. Bronze caster bearings are also available with a spanner bushing to provide increased weight capacity and strength. 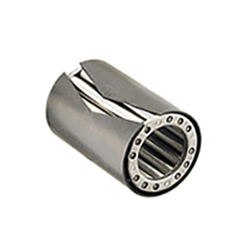 Drawn cup roller bearings, also known as drawn cup or Torrington-style bearings, are composed of just one piece, unlike the standard roller bearing; the metal outer cage permanently houses the rollers within. This bearing was engineered to create an inward retention of thrust, which prolongs the life of the bearing and makes it highly advantageous in uses for towlines, tooling fixtures and other heavy duty applications. Caged roller bearings are required to use a spanner bushing or hardened shaft and are operable in environments up to 250°F. The Delrin® caster bearing is composed of a lightweight DuPont™ acetal resin and is available in a one- or, more commonly, two-piece design. This bearing is a cost-effective and durable option available for many different wheel widths and bore sizes of 1-3/16" and 1-15/16". 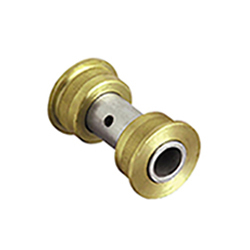 A spanner bushing is typically used with this bearing to create additional stability, but heavy loads should be avoided. 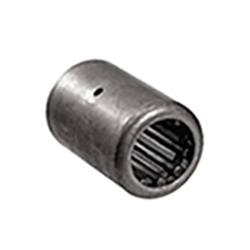 Maximum temperature is 160°F for Delrin® bearings and common applications include food service and material handling applications, wherever varying liquid, steam, humidity levels vary or brine conditions may occur. The Oilex caster bearing is best used in situations where ease of rolling is not a primary concern. 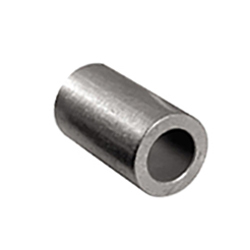 After being manufactured using a type of powder metallurgy that creates tiny pores within the resulting bronze or iron alloy, this single-piece bearing is then impregnated with an oil lubricant before sintering bonds the two particles. This bearing can endure temperatures up to 450°F and, due to its self-lubrication, requires very little to no maintenance. The pedestal precision ball bearing is a form of sealed precision ball bearing that has an integrated spanner bushing. Its maximum operating temperature is 250°F and has options featuring stainless steel material and hand truck applications. Offering the best in both ease of rolling and noise reduction, the pedestal precision ball bearing is available for 1-1/2" and 2" wide wheels with a 1-3/16" or 1-5/16" bore. Not recommended for heavy loads, the pedestal precision ball bearing is most often used for light to medium duty applications and material handling carts and requires no maintenance. A plain bore, is drastically different from roller and ball bearings. Either the axel, or most likely a spanner bushing, rests directly on top of the wheel's hub material. 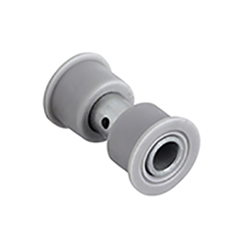 Using this style of bearing by itself is only recommended when easy of rolling is not important, but is still effective for light duty applications and uses with infrequent movement. The design provides slightly increased strength and rigidity and is also maintenance free. However, aside from cost and the previously mentioned factors, plain bores benefits. The roller caster bearing is the most popular of caster wheel bearings, and is favored for both its both strength and rollability. It consists of a split metal outer cage and the greased and hardened rollers within it. It is almost always an option, no matter the your wheel selection. However, roller bearings are NOT chemical or water resistant. 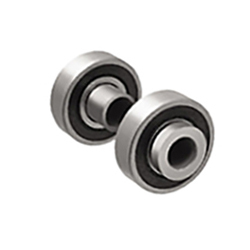 These bearings are capable of rolling at a maximum speed of 2.5mph and can handle temperatures up to 350°F. Roller bearings are available for wheels with a width from 1" to 3" and a bore of 1-3/16" to 1-15/16". Stainless steel roller bearings are also available. The sealed precision ball bearing is a two piece bearing of steel balls held by two sealed, lubricated, heat-treated raceways. 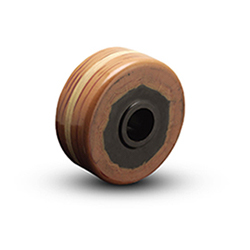 This bearing is at the top of the list in for ease of rolling and produces minimal noise. Typically found in medium to heavy duty applications, the sealed precision ball bearing is your best option when high speed and high radial thrust capacity are of concern. 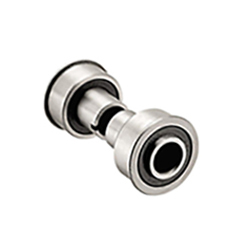 Standard with a spanner bushing to provide additional strength, this bearing requires no maintenance, has a stainless steel and hand truck option, and has a maximum temperature of 250°F. 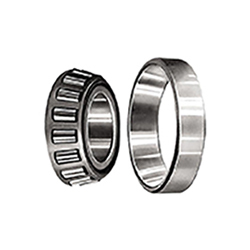 The tapered roller bearing, also known as a Timken® is a type of roller bearing and has a two-piece design. Each wheel also requires two bearings and two washers. The bear dual raceways are heat-treated and machined with the inner of the two tapered, creating a “cup and cone” design. Bore size is available in 1-3/16" to 1-15/16 options. These bearings are impact resistant and best for high speed and high load weight applications, including towlines and heavy duty or industrial equipment. The tapered roller bearing is able to withstand temperatures up to 400°F and also requires inspections and possible adjustments.